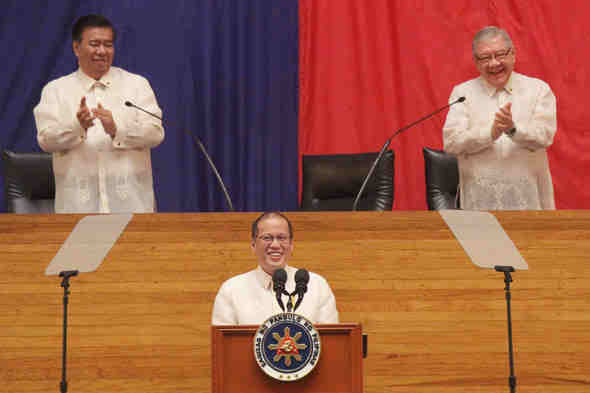 In his fifth state of the nation address, President BS Aquino made many claims to prove that he deserves the public’s continued “trust” and to bolster his record as Chief Executive. Let’s take a close look at some of those claims. Mr. Aquino claimed: Ang 27.9 percent na poverty incidence natin sa unang semester ng 2012, bumaba patungong 24.9 percent sa kaparehong panahon noong 2013. Ang three percentage points pong ito ay katumbas ng halos 2.5 milyon na Pilipinong nakaalpas na sa poverty line. Fact: Not really. The numbers were correctly-stated — but not entirely-accurate. 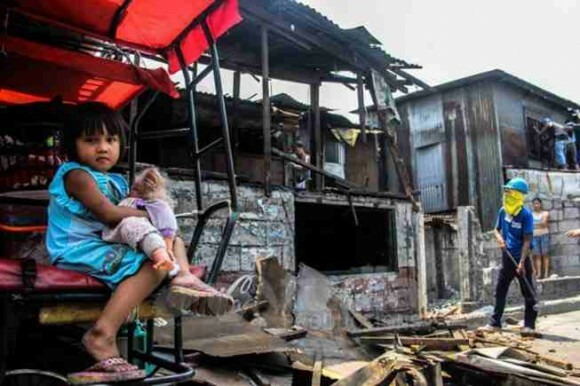 Mr. Aquino did not mention that government statisticians excluded from poverty estimates three other basic sectors, i.e., indigenous people, persons with disabilities, and victims of calamities and disasters. 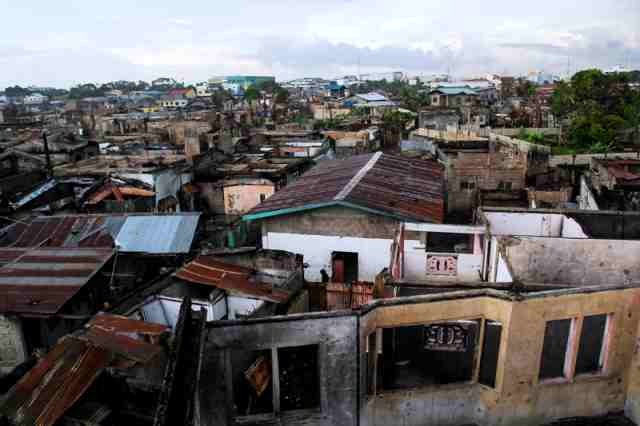 Survivors of the supertyphoon Yolanda and the Bohol earthquake are apparently not be covered in the figures Mr. Aquino cited. The government’s April 2014 Labor Force Survey also paints a rosy picture: Employment was up from 63.8 to 65.2 percent, unemployment down from 7.6 to 7 percent, and underemployment down as well from 19.2 to 18.2 percent. But the report has this caveat: Typhoon-devastated Leyte province was not covered. As of Dec. 2013, the government’s own estimates on the number of citizens affected by Yolanda are: 2,376,217 families or 11,236,054 people coming from 12,076 villages found across 44 provinces. Apparently, these huge figures of disaster survivors do not matter or are unimportant to the government’s poverty and employment estimates. Using but reinterpreting data from the National Statistical Coordination Board (NSCB), some 56 million Filipinos live off around P100 or less a day, and some 66 million Filipinos live off around P125 or less a day. The Philippines has the highest unemployment rate in Southeast Asia. 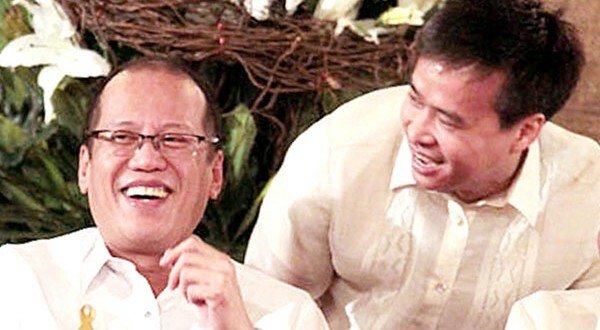 Mr. Aquino claimed: Hindi nagpatumpik-tumpik sa pagresponde ang inyong gobyerno… Nagpapasalamat tayo sa mga kasapi sa ating Gabinete, na talaga naman pong nanguna sa pagresponde sa mga apektadong komunidad. 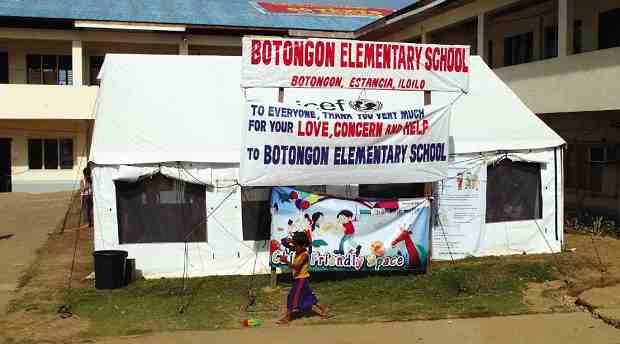 Fact: Not true, according to people of Tacloban. Fact: Not true, if Aquino was trying to interpret the UNDP official’s statement as a “praise release” for government’s effort. UNDP’s Afanasiev was referring to the people in Yolanda-ravaged communities, not the government. According to Afanasiev: I have never seen a people so resilient, so positive, matter of factly getting on with the recovery on their own, frequently in a self-organized fashion, without anybody else organizing them. I have truly come to admire the regular people in the villages, in the cities and towns, and how they just recover and get on with their lives. Mr. Aquino claimed, referring to housing for siege survivors: Pagpasok nga po ng Agosto, magsisimula nang lumipat ang mga apektadong pamilya sa mga permanenteng bahay sa Martha Drive Subdivision. Fact: Not true, according to people of Zamboanga. Mr. Aquino claimed: Isang linggo matapos ang lindol, may kuryente na sa Tagbilaran at sa lahat ng munisipalidad ng Bohol. Fact: Not true. 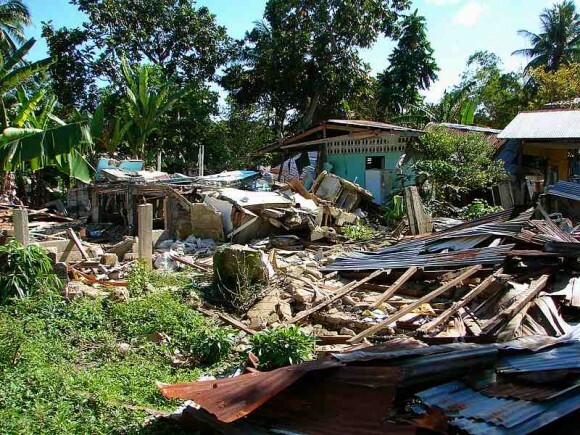 The NDRMMC reported on November 3, 2013 that power service was fully restored in the Bohol towns of Cortes, Inabanga, San Isidro and Tubigon only on October 30, 2013, or over two weeks after the earthquake rocked the provinces of Bohol and Cebu. The same report also added that power outages were still hitting portions of the Bohol towns of Antequera, Calape, Catigbian and Loon. Mr. Aquino claimed: Pinapaigting pa natin ang pangangalaga sa seguridad ng taumbayan. Facts: Not true. From January to May 2014, 1,834 cases of riding-in-tandem crimes have been reported nationwide, with 520 of the crimes committed in the National Capital Region. Meanwhile, of the 561 reported criminal incidents involving motorcycles in the NCR for the same period. Right in the financial capital, at Pasong Tamo, criminal elements continue to outwit the police and terrorize the public. A killing spree in Quezon City was also widely reported. The US State Department has said that extrajudicial killings remain the biggest human rights problem under Mr. Aquino. 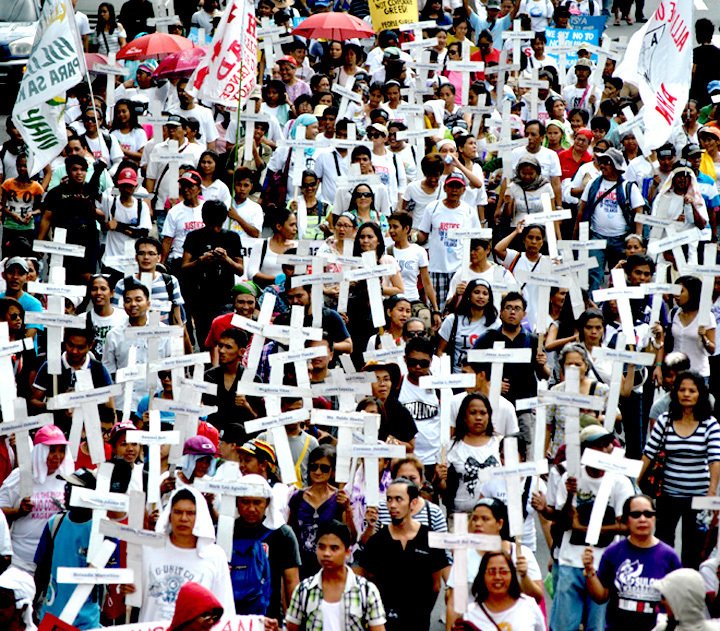 A human rights watchdog says that Mr. Aquino’s inaction has led to 169 extrajudicial killings, as of March 2014. Those expected to report the crimes are not spared: 23 journalists were murdered in the first 40 months of Mr. Aquino’s presidency. “Few suspects arrested, few cases in court and conviction rates low,” according to a report by the Philippine Center for Investigative Journalism. 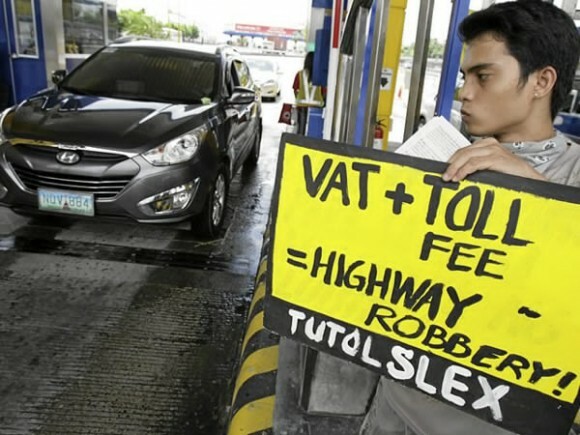 Mr. Aquino claimed: Napapalawak natin ang saklaw ng mga serbisyo nang hindi nagtataas ng buwis, maliban sa Sin Tax. The government’s profit-making fee schemes and fee increases are also implemented in state colleges and universities. The DBM expects total tuition fee payments from students to reach P7.3 billion in 2014, aside from P4.04 billion in other income also to be collected from students. UP is set to impose a 50 percent tuition fees increase. Even OFWs were not spared. Mr. Aquino claimed: Lahat po ng mga TESDA scholar, nakalista ang pangalan at iba pang datos, na puwede ninyong kumpirmahin. Fact: This is under investigation. 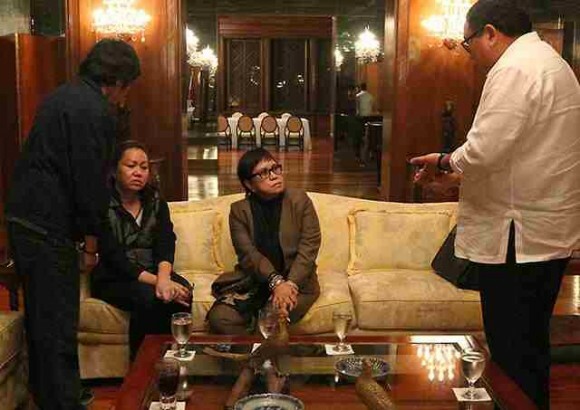 According to the COA, there were purported “ghost scholars” in the TESDA program. The COA said it cannot confirm the identities of the scholars and how they were able to attend multiple, overlapping trainings. Mr. Aquino claimed: Minanang kakulangan sa aklat, upuan, at silid-aralan, napuno na. Fact: True, only insofar as it pertains to the 2010 backlog of 60,000 classrooms. Mr. Aquino conveniently forgot to mention that his administration’s Philippine Development Plan for school year 2012-2013: 113,000 new classrooms. How about you? Did you see other mistaken, false or disputable claims in Mr. Aquino’s SONA? Share your insights and thoughts by leaving a comment.